As Valentine’s day is drawing closer, we thought we would share with you a selection of offers from a variety of our clients to help make the planning, just that little bit easier. Three Course meal with Champagne. Luxurious overnight stay with a romantic gift and bottle of complimentary bubbly with English Breakfast. Romantic Overnight stay in one of the Firmdale Hotels in London costs between £348 – £612 depending on the hotel of choice. Romantic Film Screening in Soho Hotel is complimentary and is available to join at 8:30 pm after Valentine’s day dinner which is £65 per person. Romantic Valentine’s day Meal starts from £65 and all menus are available on each of the hotels’ microsites. See here for more details. Greenwoods Hotels, based within close proximity to Essex, have created a special package to welcome those that are eager to have a romantic meal and a relaxing atmosphere. Nestled within the English countryside, Greenwoods Hotel provides the option to enjoy a romantic spa day with facilities including pool, sauna, jacuzzi hot tub, steam room and fitness suite with a chocolate facial and two-course lunch. If this sounds alluring, the offer is valid from 11th to 17th of February. Use of spa facilities including pool, sauna, Jacuzzi hot tub, steam room and fitness suite from 9am – 7pm. Resulting in a full day for you to relax and rejuvenate. The Bentley Hotel, based in the heart of Kensington, has a number of options for you to immerse yourself in this Valentine’s Day. From a 4 course dinner with a glass of champagne, a Rose Champagne Afternoon tea or a luxurious overnight stay including a romantic glass of wine over dinner, cocktail evening to follow and use of the gorgeous Le Kalon Spa. Offer includes complimentary full English breakfast in their Peridot Restaurant. Date Night Includes; Pre cocktail dinner for two, three-course dinner with a glass of wine, self Hammam use for 30 minutes, a complimentary movie in the hotel room with, Complimentary English breakfast in Peridot restaurant. Valentine’s Day Dinner; exclusive four-course Valentine’s dinner in The Peridot Restaurant whilst enjoy the four-course dinner with a glass of prosecco. Sweethearts Afternoon Tea £35 per person. 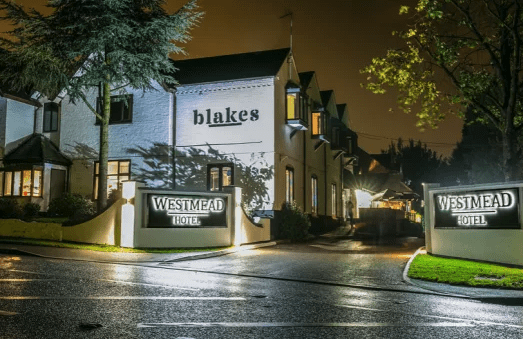 Blakes restaurant, situated within the Westmead Hotel in Birmingham has prepared a special Valentine’s day menu for those that are seeking for a little bit of romance in the Birmingham area. Blake’s is equipped with a Sicilian wood-fired pizza oven focal point and professional cocktail mixologists for your enjoyment. Valentine’s Day special: Valentine’s Day Special 3 course meal, menu available on Westmead Hotel Website. Valentine’s Day special: Valentine’s Day Special 6 course meal, with Fine de Claire oysters complemented by a cocktail. Full menu available on Il pampero.